DSRM (Directory Services Restore Mode) is a boot mode on a domain controller for repairing and restoring Active Directory data. To boot your computer into DSRM mode, you need to know the DSRM administrator password, which is set during the process of promoting member server to a domain controller. There’s a chance you could forget your DSRM administrator password because it’s so rarely used. In this tutorial we’re going to explain how to change or reset the DSRM administrator password on Windows Server 2012/2008/2003 and 2000. Log on to the domain controller using an account with administrative rights. Go to Start | Run, type cmd, and press [Enter]. At the command prompt, type cd %SystemRoot%\System32,and press [Enter]. Type ntdsutil, and press [Enter]. Type set dsrm password, and press [Enter]. At the DSRM command prompt, type q to exit. At the Ntdsutil command prompt, type q to exit the utility and return to the command prompt. Couldn’t Login to Domain Controller? You need an alternative computer with internet access to download the Reset Windows Password utility. Unzip the download file, you’ll get the ResetWindowsPwd.iso file. Burn the ISO image file to a CD or USB thumb drive using the ISO2Disc tool. Insert your newly burned CD/USB drive into the domain controller and turn on the computer. Get into the BIOS and change the boot order to set the computer to boot from CD/USB. Once you’ve gotten it to boot from the CD/USB, the computer will load the system inside the CD/USB drive and launch the Reset Windows Password utility. 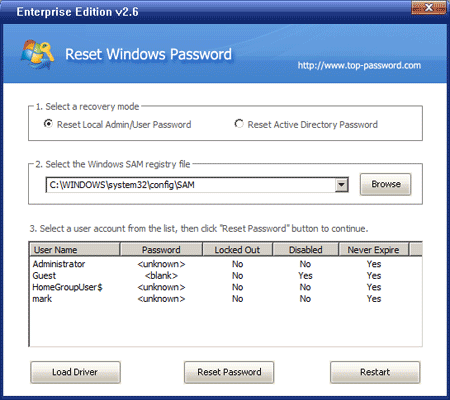 Click on the Reset Local Admin/User Password option, you’ll see the Windows SAM database and local user accounts. Choose the local administrator account and click on the Reset Password button. It will remove your forgotten DSRM administrator password immediately. The DSRM administrator password is a tremendously powerful password, and you should change it at regular intervals, along with all of your other administrative account passwords. If you forgot Windows 7 password for the only administrator user on your computer, you can’t login to the system, let alone installing password cracking software on your computer. How to break Windows 7 password? Basically, you need a second computer to create a password recovery bootdisk, it can be your other PC or a friend’s laptop. 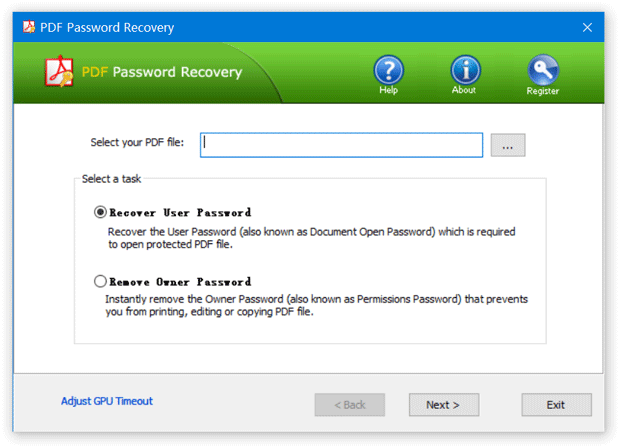 Download the Password Recovery Bundle software and it enables you to create a password recovery boot CD easily. Boot your locked computer from this CD and you can break Windows 7 password in minutes. Here is a step-by-step guidance on how to break Windows 7 password when you lost or forgot the administrator password. Use a second computer to download Password Recovery Bundle. Launch the program after installing, and then click on Windows Password button. Follow the on-screen instructions to create a bootable CD. Once you’ve created the CD, you place the CD into the computer with the forgotten Windows 7 password, and turn on the PC. If your computer does not automatically boot from the CD drive, you may need to change your boot order or use a boot menu to select the CD you want to boot from. Highlight a user account that you want to break, and click on Reset Password button. It will remove your lost Windows 7 password associated with that user account. Now restart the computer and you can then log back into Windows 7 with a blank password. Password Recovery Bundle is a must-have rescue utility to all Windows users, with the helps of this software you can break Windows 7 password in minutes. No matter you are using Windows 8, 7, XP or Vista, this program can work well on it. On bootup, Windows operating system including Windows 8/7/Vista/XP will display a Welcome Screen, with a list of user accounts existing on your computer so that user can click and login. If you want to hide one of the user accounts at Welcome Screen and protect your privacy, here’s a complete guide for you. 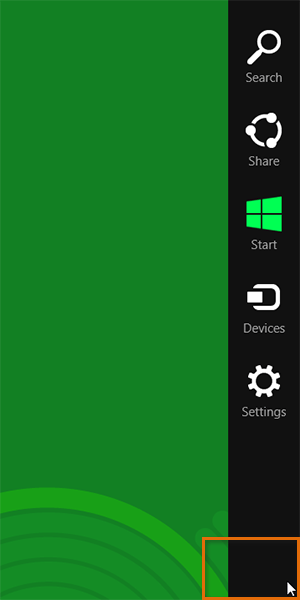 Let’s see how can we hide user account from Welcome Screen in Windows 8, 7, Vista and XP. How to Hide User Account from Welcome Screen in Windows 8/7/Vista/XP? Press Windows + R key combination to open the Run window, type regedit and press Enter key. If the SpecialAccounts key and Userlist keys do not exist then create them. 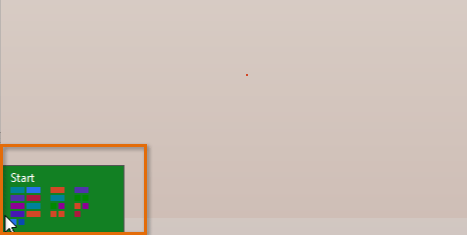 On the right hand side of Userlist, right-click on any blank space, and point to New -> DWORD (32-bit) Value. Name the new DWORD registry value name exactly with the user name used at the logon screen. Double-click on DWORD registry value, and set the value data to 0 in order to hide the account from Welcome Screen. To display the user account on Welcome Screen again so that it’s visible again, delete the registry entry, or set the value data to 1. Exit Registry Editor. Log off or restart computer to make the change effective. This trick will prevent the user account from showing up on the Welcome Screen or in the Control Panel -> User Accounts area. In Windows XP you can still log into the hidden user account by pressing Ctrl+Alt+Del two times to display Login Dialog window and type the username and password. But note that, in Windows 8/7/Vista, pressing Ctrl+Alt+Del does not bring up the login screen. If your user account is not shown up on the Welcome Screen and you’re locked out of your computer, Reset Windows Password utility could be used to remove your forgotten password or make your user account visible again. The built-in administrator account is one of the default accounts that has the highest privileges in Windows. It is by far the number one target for hackers trying to break into your computer. By default, this administrator account does not show up in the list of available accounts when Windows boots up. This is why so many people do not know that the account even exists. You would be surprised that there is also no password set for the administrator account. This can be a major security risk for all Windows users. Let’s look at some quick ways to secure the built-in administrator account in Windows 8/7/Vista/XP. Installing the Windows operating system automatically creates this account, and I promise you that every hacker already knows the default name. If you keep the name the same as the default, this provides 1/2 of the information that an attacker needs to log on as the account. Many companies will change the name to fit within the naming scheme of the other users. So, Joe Smith might be the Administrator account to obfuscate the account to novice hackers and end users. If you forgot the administrator password later, don’t worry! Reset Windows Password utility can remove your strong administrator password instantly from a bootable CD or USB drive. Log on either as administrator or as a user with administrator permissions. Expand Local Users And Groups, and select Users. Double-click the built-in Administrator account. Select the Account Is Disabled check box, and click OK.
Close the Computer Management console. The change will take effect after you log off the computer. I find that many computer users use this account for routine maintenance, tasks, and administration. I also find that this account is configured as the service account for many network services. This account should never be used, unless there is a disaster that requires that this account be used to access your computer. While it is a good practice to change Windows 7 password frequently to avoid the password hacking, we might easily forget it. In such a situation, you might want to use a Windows password recovery application that can help you to retrieve your password back. I have tested several Windows password recovery tool and it turned out that Password Recovery Bundle 2013 is one of the best cracking utility out there that allows you to retrieve lost Windows 7 password in a matter of minutes. How to Retrieve a Lost Windows 7 Password? To get started, you need to find an alternative computer which you can login with administrator user account. Download Password Recovery Bundle on the computer. Launch the program after installing, and then click on Windows Password button. Follow the on-screen instructions to create a bootable CD. Highlight a user account with the lost password, and click on Reset Password button. It will remove your lost Windows 7 password associated with that user account. Now restart the computer and you can then log back into Windows 7 with a blank password. Password Recovery Bundle 2013 is a must-have rescue utility to all Windows users, with the helps of this software you can retrieve a forgotten Windows 7 password and regain full control to your machine easily. Password protecting access to Windows user accounts is now the norm. 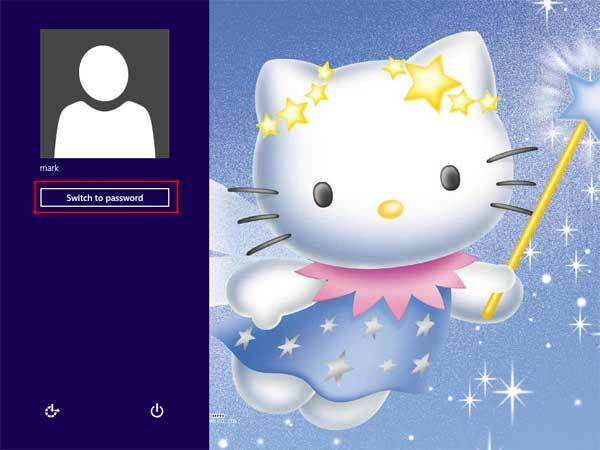 Windows 8 enables you to protect your account with a picture password. Using a picture password is much more secure than regular alphanumeric password, but it may cause big trouble when you forgot Windows 8 picture password. How to unlock your computer when you forgot picture password in Windows 8? Luckily picture password is merely a helpful alternative login method rather than something that adds security. Setting up a picture password does not replace your regular alphanumeric password, and on the lock screen itself there is an option to switch back to the standard login option. So if you forgot picture password, you can choose to unlock your computer using traditional text password or Microsoft Live account. After logging into Windows 8 you can reset the forgotten picture password easily. Still can’t login using a regular password or Microsoft account? Don’t worry! With Reset Windows Password utility you can easily reset lost or forgotten passwords for Windows 8 local administrator account and Microsoft account. It is 100% safe and will not damage any of the files on your computer. Best of all, Reset Windows Password utility has a very high success rate of 99.8% in resetting your Windows password and supports all versions of Windows. You can unlock any forgotten password on your Windows XP, Vista, NT or Windows 7 desktop computer or Windows 8 laptop. A PDF owner password is the password used to set document restrictions on PDF files. In Adobe Acrobat, the PDF owner password is called the change permissions password. If you forgot PDF owner password, you can’t print, copy or edit the content of your protected PDF file. In such a situation, you might want to use a PDF password remover application that can help you to remove forgotten PDF owner password. And PDF Password Recovery program does exactly that. How to Remove PDF Owner Password When You Forgot It? 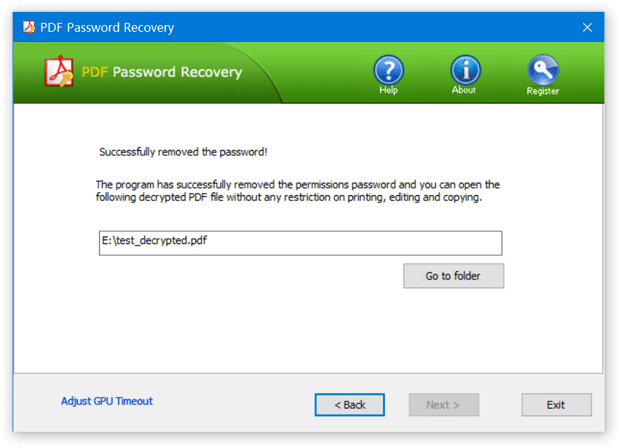 Download and install PDF Password Recovery software on your computer. Run PDF Password Recovery program, then click the … button to select your password-protected PDF document (*.pdf), then choose the Remove Owner Password option. Immediately the tool will decrypt the owner password and remove the security restrictions imposed on it, and a new non-protected copy will be created. You will then be allowed to print, copy, modify the decrypted PDF document without even knowing the password. There is no need to worry about forgetting PDF owner password. Just follow the steps above and you can remove PDF owner password quickly and easily! Remote Desktop is a handy feature incorporated since Windows XP which allows you to control your computer remotely. But this feature is disabled by default. 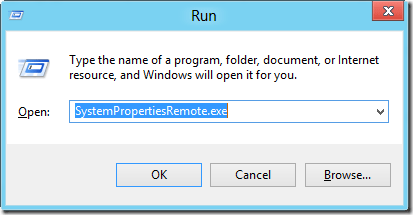 In this post, I’ll walk you through the steps to enable remote desktop in Windows 8, so you can then connect to your Windows 8 machine from a remote computer. 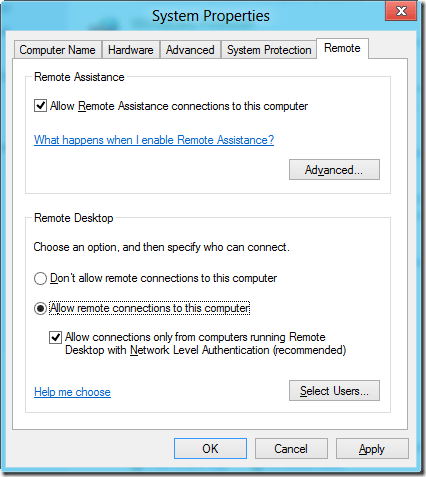 How to Enable Remote Desktop in Windows 8? Press Windows + R key combination to bring the Run command screen. Type in SystemPropertiesRemote.exe and press Enter. This will bring up the System Properties screen. Select Allow remote connections to this computer and click OK.
To access the Windows 8 computer remotely, type in mstsc in the Run command screen ( similar to step 1) from a remote computer and type in the IP Address for the Windows 8 PC. That’s all! The procedure is pretty much the same as it’s been for older versions of Windows. If there’re any issues, please check if remote desktop is blocked by Windows Firewall. Go to Control Panel and click on Windows Firewall. Click on Allow an app or feature through Windows Firewall and then scroll down until you see Remote Desktop. Make sure the box is checked.